Page 13: Again, this goes back to my complaint about the last volume: the school festival is already over, and not much happened. 16: Kyo’s lucky YouTube wasn’t around back then. But dear God, this was set back when DVDs have to be explained. Holy cow, I feel so old right now. 19: Is this the first time Takaya’s side panels haven’t begun with “hajimemashite and konnichiwa”? … Well, I quickly checked volume 15 since it was next to me, but it’s “nice to meet you” there. Guess I just didn’t notice the switch. 20: This chapter just feels so jarring already. It’s like Takaya (through Kyo) assumes like this is what we were all talking about. I mean, Kyo just is like, “Yeah, hung out with Kyoko.” I mean, even the whole Yuki-hat scene was given more of a buildup. 23: Wouldn’t Arisa make more sense as a narrator for these flashbacks? 27-28: I know all the Sohma family members are mature, but how do you bring up, “My body was like broken glass” to a child? 31: Man, he looks like someone…who is it? I mean, I know that’s Katsuya, but he looks like someone from another manga. 34: I think you either have to major in psychology or be a client in order to be a character in this manga. 42: At least this parents’ romance flashback is pretty short. Unlike Gakuen Alice. Flashback lasted FOREVER. 45: And someday his father will become partly senile and keeps calling his grandchild by his deceased daughter-in-law’s name. 60: Katsuya saying lines the heroines of other student x teacher manga beg to hear. 70: I hear Maeno Tomoaki as Katsuya. Like in his Camus from Uta-Pri. But the “so choose me” is definitely the line from “Re-Quest!” from Brothers Conflict. 75: Kagura being heartbroken off-screen. 95: This is why you should always go to the hospital just in case. 105: It’s like parents only come in two flavors in this manga: doting or jerks. 129: Seriously, someone (inside or outside) should become a counselor or something for the Sohma family. 134: And we suddenly switch to Machi. What happened to Rin and the others? 146: Again, you can only be in Fruits Basket if you have issues stemming from your parents. 161: Since Yuki is becoming more outgoing, he needs someone like the old him. The end. 163: Hatori looks rather plain. 172: Hatori stripping as quickly as possible. 175: Wonder what the results would be now, in commemoration of the sequel. 177: Yuki keeps making progress. 183-184: Everybody looks off model here. 186: Yuki forgiving everyone. You get forgiveness! You get forgiveness! Everybody gets forgiveness!! 191: I wonder if Takaya’s hand got further injured or something. The art seems to be a step down now. So a lot of drama. We learn all about Tohru’s parents, plus more about Machi. Not much progress on the main couple though. Yuki’s progression is still the bigger focus. He’s got to force Machi out of her shell. I remember not really liking her the first time around, and right now I think it’s because she’s a strange character. She’s worried she’s not part of the world, and destroying things helps her interact with the world? She’s capable, but randomly packs a bottle opener and a leaf? I don’t even understand why she’s living alone. Since I didn’t care for Fruits Basket, by this point in the series I was just reading it with little emotional attachment or analysis. From the preview, it sounds like Akito’s gender will be revealed next volume. I remember back when this series was being published in English how you could barely mention this series without people spoiling it. 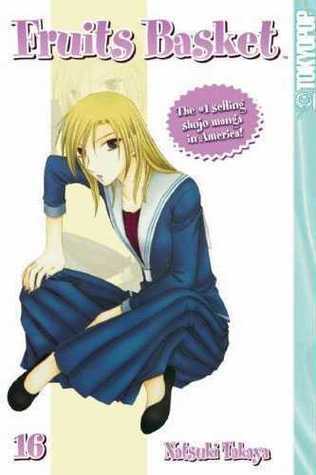 It wasn’t like I was really searching for Fruits Basket — I’ve mentioned many times now I’ve never been into the series — but it was bascially manga–>shoujo–>Fruits Basket–>AKITO’S A GIRL!!! KYOXTOHRU FOREVER!!! THIS IS THE BEST MANGA EVER!! So any shock factor or intrigue on my part was stolen thanks to the Internet. Part of that I’m sure still colors my enjoyment of the series, even though I’m trying to read this series with an open mind. Oh, and is it just me, or did the art level down again? Even looking at the next cover Hana looks like an old woman. All the characters look older. They’re teenagers and young adults; their faces shouldn’t age so much in a year or two. Hairstyles and expressions seem simplified, and I wonder if Takaya was under a lot of pressure. Obviously this series went on a lot longer than expected, and the series was much more successful than she ever expected. So since this was her first (and arguably only) major hit, she was probably facing a lot of deadlines doing promotional artwork, color pages, and plus the manga itself. But while I have no artistic skills myself, it’s hard to argue art doesn’t play a factor in enjoying manga. It’s not like reading a 70s/80s manga where that was the style then. Fruits Basket starts off shaky, gets better, but then takes a hit, then another. It’s not Takaya’s fault, but it’s no different than if a major character is written out of a sitcom or drama: it just isn’t the same, and even if the actor had good reason to not come back, the change affects everything. DVDs are old tech? I still remember VHS! I still have my old Sailor Moon VHS tapes.